Escape from the world to our luxury cosy self catering shepherd’s hut for 2, complete with central heating, internal kitchen and bathroom. Many footpaths, wonderful remote location. 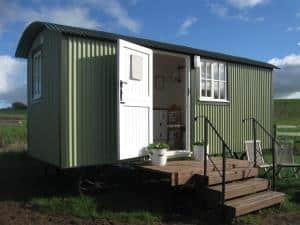 Escape from the world to our luxury cosy shepherds hut for 2 set on a working mixed farm close to The Malverns and Tewkesbury. Get close to nature, feel the remoteness of the British countryside and relax to huge star filled skies. Walk and picnic on the farm. Enjoy excellent food in local Michelin star restaurant. Special offers available for October bookings. Accommodation includes, double bed, dining area, fitted kitchen and bathroom, electricity and running water.